All-electronic color television has been achievedâ€” no rotating disks, no flicker. You’ll be seeing it! THE magic of the electron tube has been tapped again by modern Aladdins at RCA laboratories, and out comes television in color. It is all-electronic color, for the first time; no mechanical whirling gadgets to “mix” the colors. The studio scene is broken up into the three primary colors of light, red, blue and green. The signalâ€”which means the pictureâ€”is transmitted through the air in three separate channels. At the receiving end the three incoming pictures are thrown simultaneously on a screen, producing full color again. Since the rotating disks previously used to mix colors in television are absent in the new method, there is entire absence of flicker on the receiving screen. A technicolor moving picture was broadcast in a demonstration at the RCA laboratories at Princeton, N. J., and the invited reviewers were able to see it reproduced in the original colors on a screen 15 by 20 inches. Brig. 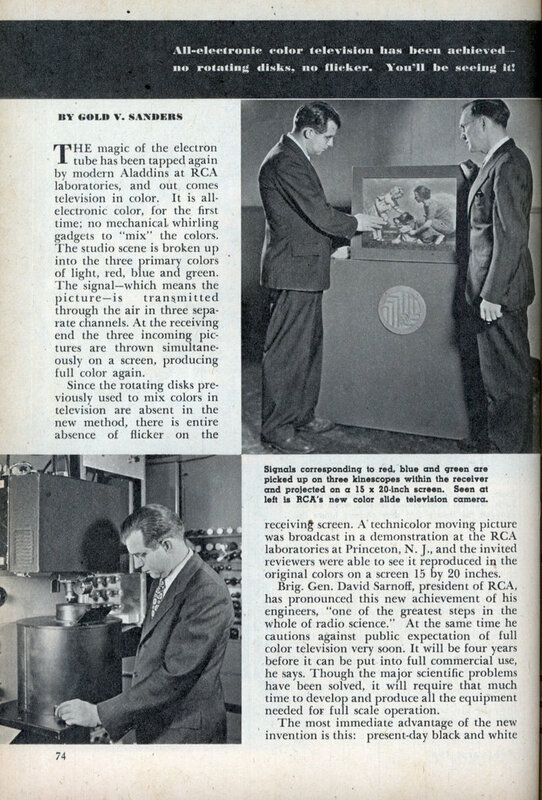 Gen. David Sarnoff, president of RCA, has pronounced this new achievement of his engineers, “one of the greatest steps in the whole of radio science.” At the same time he cautions against public expectation of full color television very soon. It will be four years before it can be put into full commercial use, he says. Though the major scientific problems have been solved, it will require that much time to develop and produce all the equipment needed for full scale operation. The most immediate advantage of the new invention is this: present-day black and white equipment may be developed and expanded fully without fear of obsolescence. This is because the receivers now in use can also be employed to receive all-electronic color broadcastsâ€”but only in black and white. The green signal of the RCA type of color transmission reproduces as black and white on these sets when they are equipped with a relatively cheap frequency converter. This would be like a color-blind person viewing a Technicolor movie. He would get perfectly satisfactory entertainment, even though he could not see the colors the others were seeing. But in order to receive full color television, when it is available, owners of these black and white receivers will have to buy new sets. The RCA color system employs three filters to separate the primary colors of the image to be broadcast, just as is done with mechanical color broadcasting. The green filter passes only those parts of the picture that have green in them, and the red and blue filters do similarly for red and blue. Since all colors are made up of these three primary colors of light, all visible colors can be broadcast and received. Where the RCA method departs entirely from others is in the broadcasting technique. Three separate frequencies are employed, one for each of the three primary colors. The moving picture, studio play, or whatever image is to be transmitted, is broken up into these three parts by a system of color-selecting mirrors and photocells that convert it to electric impulses. In the receiver, three kinescope tubes pick up the three individual color signals, all of which arrive on time, perfectly synchronized. Cathode ray projection tubes project all of them on the receiving screen through three lenses, forming the complete image. I wonder if they were just simplifying the concept for the layman, or if there were changes to the spec before it was finally implemented, but their explanation of the color transmission — using three frequencies, one for each color — isn’t really true. NTSC color data is carried on a frequency subchannel, but it isn’t split into separate red, green, and blue channels — instead the amplitude and phase indicates the overall hue. This allowed black and white sets to remain compatible with color transmissions, as they just ignored the new color subchannel, but still displayed the existing luminance information. As I recall the spec did change for the exact reason that they wanted a compatible color system. Amazingly enough the CBS spinning wheel has actually been approved and it was not compatible and had less resolution than the current 525 line B&W. The UK and Europe eventually better color becausee they did not require compatability. 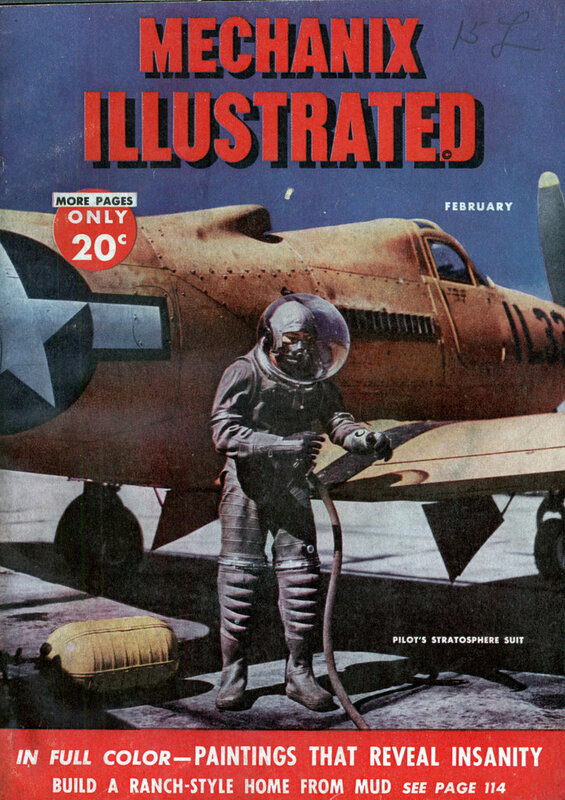 RCA in about 1960 or so b’cast a color show that only a few saw in color, but millions saw in B&W. The spinning wheel system would have been awful! The article describes an early RCA color system, and not the NTSC system that the US finally settled on. NTSC combines two color signals onto one subcarrier. (The official name for the transmission mode is QAM.) At the transmitter, NTSC discards the subcarrier, except for bursts that occur between color lines. Sending three color signals is unnecessary, because the TV receiver reconstructs the missing third signal. In your article, notice the reference to projecting three color images and combining them. This reference proves that the three-gun, color picture tube wasn’t public yet. Today, we still use descendants of the original, three-gun CRT. Of course, other technologies such as DMM, plasma, liquid crystals and OLEDs are rapidly obsoleting the poor CRT. The UK and European PAL and SECAM systems aren’t really “better color.” These systems have more lines of picture definition than our NTSC does. Yet these systems also transmit at fewer frames per second than NTSC does. The lower frame rate necessitates higher flicker. Brighter pictures accentuate this flicker. Also, the Europeans halve the vertical color resolution. PAL and SECAM take up more spectrum space than NTSC channels do. The more spectrum-thrifty NTSC is also less noisy. In the days when color sets were very expensive, Col-R-Tel cheaply adapted monochrome sets to color. To produce color on a monochrome set, Col-R-Tel electronics translated the picture into field-sequential color. That is, one color at a time. Viewing the picture through a synchronized color wheel, the viewer saw full-color pictures. Col-R-Tel proves that color wheel sets can work just fine, as long as they’re compatible. Of course, unlike the ill-fated CBS system, Col-R-Tel was compatible with NTSC. So you see, the spinning wheel system, while crude by today’s standards, is delightful and not “awful.” A final note: Many NASA spacecraft have used color wheel TV cameras. Among these spacecraft were several Apollo missions and the Space Shuttle. For more detail, see my page on Col-R-Tel and the NTSC system at… http://www.hawestv.com/….